Had a very interesting discussion this week with a leading industry analyst who covers the Application Performance Management (APM) space. It had been more than two years since we had briefed her. Getting into the briefing she was a sceptic. 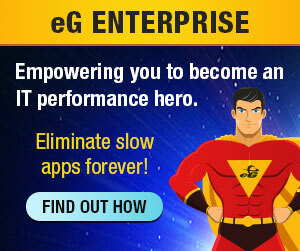 She had been introduced to eG as an APM vendor several years ago, and wanted to know what was new in our APM solution. She heard from our PR manager that we were into virtualization management now and was even confused as to whether she should speak to us or one of her colleagues who covers virtualization should (even the analysts seem to work in silos!!!). Any way, she decided to make the briefing and the first thing she wanted to know was why we’d given up on APM and moved to virtualization management. While BSM seems to be quite popular in the physical world, very few in the industry seem to have recognized its importance in the virtualized world as well. This article – http://itknowledgeexchange.techtarget.com/server-virtualization/egs-software-a-hit/ – highlights why you should care about your business services in a virtualized infrastructure as well. Srinivas knows I will like this post; I’ve been preaching BSM with the eG Suite for years now. In fact, I’ll be starting monthly (30 minute) webinars that will focus on topics relevant to BSM and ITSM with service oriented monitoring (see http://www.brighttalk.com/channels/9094/view ) The first one’s titled, “Maximizing the Value in Performance Monitoring Software” and is planned for early March. Needless to say, I am very excited about the prospects for eG and BSM!!! Interesting post by Derek Mier, an new Forrester analyst who will be focusing on BPM.